The past several months have been ones of intense struggle for me. At times, I have wanted to crawl under the covers and just sleep. Sometimes I have. But other times, even while tempted to wallow in self-pity, God has been gracious to remind me of the many blessings he has poured into my life -- blessings that are cause for worship! Even the most stalwart Christians I know are not immune from the troubles of this world. Some of us handle our challenges better than others, but we all can find reasons at the end of the day to thank our Maker for his gracious gifts to us. God has shown me, particularly in the past couple of weeks, just how dangerous it is to seclude ourselves from the fellowship of our church family because we think that somehow scaling back will give us more time and energy to find a solution to our problems and figure out what God is trying to teach us. Granted, it is good to spend quiet time alone with God each day and to seek his heart and mind on the matters that bewilder us. But, there is an inherent danger in severing our ties with others by limiting the areas of service that bring us great joy and place us in the path of people who encourage and build us up. The only thing I have really accomplished in the past several months is to subject myself to the ravages of anger and depression. The circumstances I had hoped would change as a result of being home more and less involved at church, haven't really changed much. And somewhere along the way I have lost my joy because I have given up the fellowship of believers and the pleasure of corporate worship through my involvement in music ministry. No man is an island. We all need each other, more now than ever before. If you are struggling with depression or anxiety and find yourself in a pit of self-pity, get out of the pit and back in the choir (that is, if you ever sang in the choir)! Take the focus off you and your problems and re-focus on the Lord by reaching out to others in service and fellowship. Why wallow when you can worship? Of all the people in my life, my mom is probably my greatest source of encouragement, particularly when it comes to my writing. Moms are supposed to do that, you know -- encourage their children, display their artwork on refrigerators and coffee tables, and brag every once in awhile. But my mom goes way beyond that most days -- sometimes she not only encourages but absolutely inspires me. I know exactly how you feel.....taking the same problems and people before the Lord every morning. And some mornings I try to "re-arrange" the order so HE doesn't get tired of me saying the same things over and over. Silly me, and I then have to remind myself that He says it is okay and all is well with Him and me. Don't you just love that? Mom hit the nail right on the head! It doesn't matter how often or in what order we offer our prayers to God. The Bible tells us that Jesus "lives to intercede" for us (Hebrews 25:7)! How awesome is that? Next time you feel like a broken record and wonder if your prayers are going through, make sure that you have confessed your sin, offered God your sacrifice of praise (Hebrews 13:15), and given thanks for all his wonderful deeds in your behalf. Rest in the assurance that even when we do not know what we ought to pray for, "the Spirit himself intercedes for us with groans that words cannot express" (Romans 8:26). For only the second time in my life I am endeavoring to read through the entire Bible in a year. One of my favorite verses in all of Scripture is Job 23:10, but we'll get to that later! I was reading the twenty-third chapter of Job in the New Living Translation paraphrase when verse two jumped off the page. "My complaint today is still a bitter one, and I try hard not to groan aloud." Some days don't you feel like a broken record as you take your concerns to the Lord in prayer? Lord, I really need a job. Lord, can't you fix my spouse? When, O Lord, will my teenager finally become responsible and respectful? I know I do, and although I know God promises that he will work all things together for my good (Romans 8:28) and supply all my needs (Philippians 4:19), I still have trouble not complaining about the problems that seem to be a permanent part of my reality! There's hope in this chapter of Job, and it is found in my favorite verse -- “But he knows where I am going. And when he tests me, I will come out as pure as gold." No matter how difficult life gets, how hard the trials may be that come, in the end I will come through refined, polished, and more valuable as a witness of God's grace and goodness. So will you! We all have those people in our lives that bring out the worst in us. No matter how hard we try to be civil, understanding, and loving toward them, there is something about their personalities or lifestyle choices that sets us on edge, shreds every ounce of patience we have, and leaves us feeling like we have been run over by a freight train. If you are the parent of a strong-willed teenager or adult child who has not quite grown up, you know exactly what I mean. If we didn’t have God’s Word to teach us how to love others and the Holy Spirit to convict us of our own wrongdoing when we allow others to bring out the sinful nature in us, we would be lost and without hope. But we do have God’s Word and the Holy Spirit to guide us, giving us the strength and resolve we need to extend the love and grace of God to even the most difficult people in our lives. Seldom is it easy, but it is possible to love someone who isn’t easy to love. The most important thing we have to remember is that God loves not only us, but also the person we find so challenging to love. Jesus didn’t just die on the cross for us; He also died for them! In the Sermon on the Mount, Jesus commanded His followers, “Love your enemies and pray for those who persecute you, that you may be sons of your Father in heaven. He causes the sun to rise on the evil and the good, and sends rain on the righteous and unrighteous. If you love those who love you, what reward will you get? Are not even the tax collectors doing that? Be perfect, therefore, as your heavenly Father is perfect” (Matthew 5:44-46, 48, NIV). Sometimes when we are in the heat of the battle with others, especially with those in our own families, we may feel as though we are being persecuted for the stand we take or the beliefs we hold. We must remember the words of our Lord and continue loving and praying even for those who offend us. Although we may be powerless in our own strength to love difficult people, God’s grace is sufficient in our weakness to love even those we would consider a “thorn in our flesh” (2 Corinthians 12:7-9). It is important that we control our tongues and that we demonstrate God’s love to others, particularly those who most need it. If we cannot control our anger and instead lash out against those who hurt or offend us, how will they come to know God and His love? They must first see it demonstrated in us. The Apostle John wrote these words: “Dear friends, let us love one another, for love comes from God. Everyone who loves has been born of God and knows God. Whoever does not love does not know God, because God is love. Dear friends, since God so loved us, we also ought to love one another” (1 John 4:7-8, 11). Will you endeavor, by the power of the Holy Spirit, to demonstrate God’s love to that person you find so difficult to love? Perhaps the place to begin is by praying for that individual and asking God to give you eyes to see him or her the way God does, as someone so dearly loved that God was willing to give His only Son to open the way to eternal fellowship with Him. Still tired from yesterday's romp around the neighborhood as I tried to track down the owner of two very sweet dogs -- a gorgeous Great Dane and his sweet companion, a feisty chocolate Labrador Retriever -- I'm still trying to figure out why they came to us in the first place. I still laugh at the thought of me driving around town in my pajamas with a bad case of bedhead and two very large dogs in my little red car and discovering that their owner was someone I had recently met. I was forty five minutes late for work as a result of the escapade, but was pleased to have done a good deed and helped a couple of four-legged friends in the process. Some days are like that, aren't they? Full of unexpected surprises that often set our day in motion and leave us feeling exhausted and satisfied at day's end, even if we are a little bewildered. We often have to make split decisions and trust God for a good outcome, which is precisely what I did in the case of the dog chase. I am thankful that all ended well for those concerned. Everyday can be an adventure in serving God, if we are open to the opportunities to do good to our fellow man and perhaps even the occasional canine companion. Wherever you are today, ask God to give you a glimpse of his purpose and to use you in a unique way to make a difference in someone else's life. We all need someone looking out for us, even if we don't realize it. And there will always be someone we can help if we are willing to give up a little time and energy. January has become my least favorite month of the year. It is the month in which I have lost dearly loved family and friends. In the past couple of weeks, a handful of people I have personally known have passed away. More and more I am reminded that it's just a matter of time before each of us will draw our final breath. The older I get, though, the less afraid I am of that day when I, too, will die. As a Christian, I know that to be absent from the body is to be present with the Lord (2 Corinthians 5:6), and I cannot think of a place I would rather be than in his presence. The fourteenth chapter of John is a familiar passage of comfort which begins with these words spoken by Jesus himself: "Do not let your hearts be troubled. Trust in God; trust also in me. In my Father's house are many rooms; if it were not so, I would have told you. I am going there to prepare a place for you. And if I go and prepare a place for you, I will come back and take you with me that you also may be where I am" (vs. 1-3). Are you standing in the power of Christ today? If he came to take you home, would you be ready? If you answered no to either question, I invite you to receive Jesus as your Savior and Lord. He died to forgive your sins so when you die, you can spend eternity with him. If you have any questions about what it means to be saved, or if you make the decision to receive Jesus as your Savior, please email me at deedeewike@bellsouth.net. I would count it an honor to pray for you. Two of the most dangerous theologies in the church today are prosperity theology and "name it and claim it" theology. If one were to lift the above scripture out of context, it would be easy to see how one could use it for those very purposes. God did, in fact, promise Jacob to multiply his descendants and give him the land on which he lay (Genesis 28:13-15). But his promises were never meant to be taken out of context and made to fit our circumstances or selfish desires. God promises many things in his Word and he expects us to know his Word well enough to stand on his promises for provision (Philippians 4:19, Matthew 6:33), healing (James 5:16), peace (Isaiah 26:3), guidance (Psalm 73:24, 139:10; Isaiah 58:11), and wisdom (James 1:5). But we must realize that even in fulfilling his promises, often God's ways are not our ways (Isaiah 55:8) and that sometimes he fulfills his promises in his own time frame, according to his own plan and purpose for us. Like Jacob, we need to be in close communion with God daily through his Word and in prayer. Only then will we be able to clearly understand God's will for our lives. We are told that God's Word will not return to him empty, but will accomplish what he desires and the purpose for which he sent it (Isaiah 55:11). As we grow in our knowledge of God and his Word, we can confidently rest in his promises knowing that "the LORD is faithful to all his promises and loving toward all he has made" (Psalm 145:13). For me, the most challenging aspect of parenting has been raising a teenager. Being at odds with my son is not something I enjoy, yet I know of many parents in the church who either are, or have been, at odds with their children at one point or another. When a child enters a season of rebellion, many thoughts come to the mind of a parent. What have I done wrong? Where did he learn that? When will this heartache ever end? I have even asked the question of God: "Were you ever at odds with Jesus?" The Bible tells us that Christ was one with the Father (John 14:20), obedient unto death, even death on a cross (Philippians 2:8). Nowhere in Scripture can I find that the Father was ever at odds with his Son except during that moment of agony when he turned his face away as Christ hung on the cross (Matthew 27:46), bearing the weight of our sin . I imagine, though, that his earthly parents, Mary and Joseph, must have been exasperated when Jesus went missing from the family caravan as they began their journey home after celebrating the Feast of the Passover in Jerusalem (Luke 2:41-49). Jesus was twelve, nearly a teenager, and he decided to hang around the temple after the feast was over. Unaware of this, Mary and Joseph headed for home, thinking he was among those traveling with them. After three days of searching they finally "found him in the temple courts, sitting among the teachers, listening to them and asking them questions" (v. 46). Fully God yet fully human, Jesus had his heart set on doing his Father's business, even if that meant going against the flow and causing his family concern. As long as we live on the earth as followers of Jesus, there will always be division and conflict. Whether the conflict is between members of our own family or humanity at large, spiritual warfare is inevitable. The question for us is whether or not we love Jesus enough to give him first place in our lives, standing for his principles of living rather than compromising for the sake of maintaining peace with those closest to us. We can only pray that as we stand for the truth of God's Word and live as witnesses of God's love, grace, and mercy, that the hearts of those who are against us, and ultimately against him, will soften and eventually surrender to his grace and salvation. The chasm may be wide, but Jesus came to bridge the gap. "Let us hold unswervingly to the faith we profess, for he who promised is faithful" (Hebrews 10:23). Recently I went to the eye doctor for a vision checkup, not because my eyes are giving me trouble but because I had broken my two-year-old glasses and needed to have them replaced. Since breaking my glasses a few weeks ago, I have been forced to wear even older glasses with a weaker reading lens, resulting in a little bit of a blur when the print is really small. It's funny what a difference a little magnification makes! Wouldn't it be nice if someone made glasses for the heart so we could see the potential in those who disappoint us, the opportunities that masquerade as problems, and the Light that has overcome the darkness that surrounds us? Instead of being discouraged by the faults of others and our own shortcomings, wouldn't it be great if we could see things from God's perspective? As a parent, even on my best days I need a different perspective! I need to envision the great individuals my children will become as a result of the challenges they face, rather than the mistakes they will make as they grow toward independence and maturity. I need to remember that I was once their age, too, and I turned out okay! In what area of life do you need your vision to improve? Relationships? Finances? Your own sense of self-worth? God has given us something far better than glasses to enlighten the eyes of our hearts -- he has give us his Word. If you are struggling to catch a glimpse of a more glorious future for yourself and your loved ones, read God's Word with your eyes and your heart. Not only will you begin to see things a little differently, but you will also enjoy the peace and contentment that come as you dwell in God's presence and stand on his Word. If you could see my office right now, you would see the same thing I see -- one big mess! I have just enough pride, or shame, not to post a picture of it on this blog, but I can promise you that the desktop is cluttered. Perhaps the reason I keep it messy is so I don't have to dust so often! 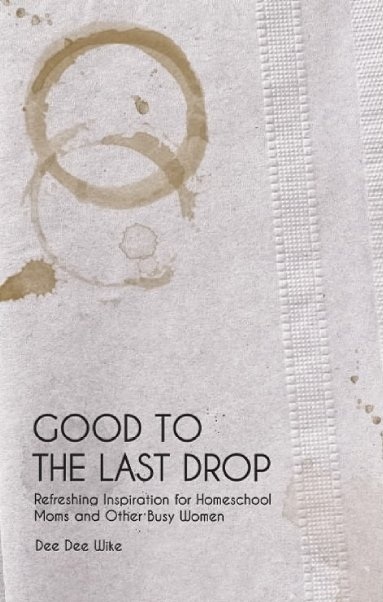 When I was considering book covers for Good to the Last Drop: Refreshing Inspiration for Homeschool Moms and Other Busy Women, one of the cover options depicted a napkin with coffee stains (pictured here). Although I did not select it for the cover of my book, it spoke volumes to me of how messy life can be. No matter how hard we try to do everything by the book, how well we try to behave ourselves, or how much effort and planning we put into our daily lives, inevitably something falls apart and we are left wondering what went wrong. Sometimes our messes are caused by our choices, like my decision to play in the snow or watch TV with my kids instead of filing the loose papers in my office and polishing my desk. But often our messes just happen. Even when we cannot prevent bad things from happening, we can choose the attitude with which we will face our problems and either be stressed or blessed by our mess! The next time you find yourself with a mess on your hands, just raise those hands and praise God anyway! 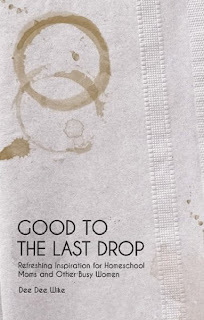 Instead of crying over the spilled milk in your life, grab a towel, wipe it up, and move on. Before long, you'll become so good at dealing with the messes in your life that life won't seem so messy after all! I almost hate to admit it, but I really miss my microwave! Last night as we were preparing to pop a bag of microwave popcorn to enjoy on the first snowy night of winter, the microwave began making horrendous noises and smelled like it was burning. Have you ever tried to pop microwave popcorn in a pot on the stove? Let me save you the trouble....it doesn't work! And those little reheating tasks I have taken for granted all these years now require more time and effort to accomplish. While I realize that's not the end of the world, honestly I have better things to do with my time than wash the extra dishes required by more conventional cooking methods. We like our modern conveniences, especially those that save us time and effort. Why hand write and mail a card when you can more quickly type and send an email, right? Somehow, though, a handwritten sentiment still touches us like no email can because of the time and effort taken to write something thoughtful. When it comes to the Christian life, there is no such thing as microwave Christianity. Becoming a mature Christian is an ongoing process that takes years and requires time spent in God's presence, in fellowship and service with other believers, and in the study of God's Word. As we grow in our relationship with God, we realize that sometimes his answers to our prayers don't come as quickly as we would like, but they always come on time and are worth the wait! Just as a roast cooked in a crock pot is often more tender and flavorful than one cooked in a microwave, believers who invest their time seeking a more intimate relationship with God are "the aroma of Christ among those who are being saved and those who are perishing" (2 Corinthians 2:15). Instead of rushing through another day, be intentional about spending time seeking God's presence through prayer and his Word. As you invest your time in building a closer relationship with him, you will find greater strength, joy, and peace to carry you through even your most trying days. When the family computer succumbed to a malware attack, I spent hours trying to determine the source of the virus, running scans and downloading software to rid the computer of the pesky program, and thinking about the effect this would have on the future of computing as my family knows it. Certainly it will be necessary to take additional security precautions, but equally important will be educating my family about the dangers of visiting websites where malicious programs might lurk. As I waited for the anti-malware software to finish its work, I began thinking about the effect of sin in our lives. Much as stealth programs and viruses worm their way into our computer hard drives, wreaking havoc with security and rendering even the most routine tasks nearly impossible, sin often finds us vulnerable to attack and causes us to break down morally, spiritually, emotionally, and physically. More often than not we make the deliberate choice to sin, but sometimes we are blindsided and caught in its vice before we even know what hit us. Before long, we find ourselves in the clutches of sin, not knowing just how to get out of the mess we have made of our lives and often hurting others as a result. But just as my anti-malware program scans every little file in search of the malicious virus so that it can be destroyed and my computer restored to health, God searches our hearts and minds and cleanses us from our sin through the shed blood of his only Son, Jesus. As Christians we have a choice to either let sin infect us or to be so filled with the love, grace, and Spirit of God that we become infectious to those around us. Having spent a great many years infected by habitual sin, I now know that the greater joy and freedom are to be found in a walk of obedience to the Lord. The more I take in his Word, worship him, and talk with him in prayer, the less likely sin is to worm its way into my life and for the enemy to gain a foothold. If you find yourself infected with sin rather than infectious with God's love, take a few minutes to confess your sins to God, pray for his forgiveness, and ask him to fill you with his Spirit and with great joy. God wants his children to be infectious with the love of his Son, and he warns those who infect others by their sinful acts. "Jesus said to his disciples: 'Things that cause people to sin are bound to come, but woe to that person through whom they come. It would be better for him to be thrown into the sea with a millstone around his neck than for him to cause one of these little ones to sin'" (Luke 17:1-2). If You Don't Like the Program, Change the Channel! Our minds are a lot like television. On any given day our thoughts and emotions are as varied as the programming options from our cable or satellite provider. We experience fear, elation, depression, excitement, encouragement, anger, sorrow, regret, and joy -- sometimes even in the same twenty-four hour period! One Friday night I found myself angry and too tired to deal with my own emotions. Although it was only seven o'clock, I decided the best thing I could do was go to my room, crawl under the covers, and just go to sleep. Maybe you are one who gives up easily and does the same thing when life is just too stressful. On my way to my room, however, I grabbed my laptop, Bible, journal, and a pen, deciding that I would do something productive instead. After all, it really was too early to go to bed and I didn't want to give the enemy the satisfaction of having rendered me useless for the rest of the night. I opted to change the "stinkin' thinkin'" channel and redirect my attention to something a little more beneficial. After watching a helpful webinar on book marketing, I curled up in bed with my daughter and watched a musical on my laptop. By simply making the choice to shift my focus from my anger and fatigue to a more productive use of my time and my mental energy, I found myself physically restored and relaxed enough to enjoy a good night's sleep. Satan loves it when we become so defeated by the negative messages in our brains that we cave in, shut down, and become useless to God and to those around us. I, for one, am tired of beating myself up for having a faith so weak that I buy into the enemy's plan! Perhaps you are, too. God's Word gives us all the ammunition we need to fight the enemy and beat him at his own game. The problem is, many of us don't know the Word well enough to fight effectively against the enemy. Perhaps instead of spending so much time in front of the TV, we ought to spend a little more time reading and memorizing God's Word so that we can more effectively fight off the devil's attacks. If you really want to change the channel -- and the course of your life -- try spending a few minutes in God's Word each day. One of my favorite passages is the third chapter of Colossians, which begins with the following verses: "Since, then, you have been raised with Christ, set your hearts on things above, where Christ is seated at the right hand of God. Set your mind on things above, not on earthly things" (vs. 1-2). It has been said that "what we think about, we bring about." If you don't like what you are seeing in your own life, then change the channel and ask God to help you see his purpose and plan for your life. "Turn your eyes upon Jesus. Look full in his wonderful face. And the things of earth will grow strangely dim in the light of his glory and grace" (Helen Lemmel, 1918). One of the hardest things we will ever do in this life is let go of that which is comfortable or treasured. Whether it is the money we have worked so hard to earn and become so dependent upon, the comfort of a routine that has become deeply ingrained in our daily lives, or a sinful pleasure that we can't imagine giving up, our refusal to open our hand and release that which we so tightly grip can actually stand in the way of God's bigger blessings for our life. When it comes right down to it, we have little control over some of the things that happen to us, so why do we try so hard to control everything? Take money, for instance. Despite the needs of so many around us and the fact that we are so much more blessed than others, we are hesitant to give our money to causes that could help because we are afraid that there will be nothing left to take care of our own needs. In God's economy, that is that exact opposite of what he teaches us. "Give, and it shall be given to you," says Jesus in Luke 6:38. Several years ago I was employed in full-time ministry at my church in a position that gave me a great sense of fulfillment and purpose. At the time, my children were both under the age of ten so I made sure my schedule was flexible enough that I could be home with them before and after school. But as my children grew older, their need for my time and attention increased. The overtime I had to work on occasion, coupled with the emotional toll the job took on me at times, left me with little to offer my own family in the evenings. When I realized that God was calling me to an even greater ministry at home, I resigned my position at the church, even though it was one of the hardest decisions I have ever made. I loved that job and the people I served with, and it took me a long time to get over the loss of being with them and doing a job that was so well matched to my gifts and abilities. But God had a greater blessing in store for me, one which I would have totally missed had I not been obedient and let go of the job I had come to love so much. 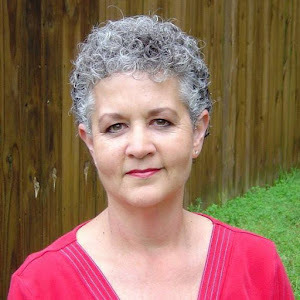 Although my obedience resulted in the loss of a full-time salary, which took a financial toll on us, the blessings of a closer relationship with my husband and children, a more intimate walk with God, and a new ministry as a writer and speaker far outweighed anything I lost by surrendering to God's will. What area of your life are you holding onto for dear life? Could it be that God is calling you to make a change but you are afraid to step out of the boat? If we aren't careful, the things that mean so much to us can quickly become idols and a hindrance to a closer relationship with God. If God asks you to give up something or someone you have come to love, be obedient and trust him for a bigger blessing! Dare to open your hand and release the thing you so tightly hold! Only when your hand is open can you receive the bigger blessings God has in store for you. The older I get the more certain I am of one thing: sometimes life just doesn't make sense. As hard as we try to live responsibly, love unconditionally, and conduct ourselves ethically, bad things still happen to good people. We make mistakes, suffer tragic loss, and often fail miserably in our efforts to be successful in our careers and in our relationships with others. With the odds seemingly stacked even against the good guys, how can any of us live without regret? I personally have known good people who have suffered undeserved and devastating loss. Despite living for God and walking in obedience to him, they have encountered unimaginable tragedy. Yet they have somehow managed to move past their grief and go on living and loving, changed by their circumstances but not crippled. They have endured seemingly endless seasons of sorrow, asked all the "why, me?" questions, and come away with very few answers, yet they have continued to trust in the very God who allowed their loss. Many have even said, "If I had it to do all over again, I would in a heartbeat, because God has taught me so much and drawn me closer to him." Perhaps you are so wounded by loss that you have become bitter and cannot even utter God's name. He understands because he himself suffered indescribable loss when his only son, Jesus, died on the cross to save us from our sins. Yet God's love for us is so pure that there is no room for regret. He continues to pour out his love on undeserving sinners like us, even though he knows that some will reject him. The only way we are able to face our sorrow and live without regret is by following God's example of unrelenting love and sacrifice. If we will turn away from our bitterness and draw closer to God, he will draw near to us. If we will look for his purpose in our pain, he will use what we have suffered to bring comfort to others. That is when true healing will take place. All of life boils down to choices. The choices we make often define us. From the moment our alarm clocks sound in the morning, we make choices. Get up or hit the snooze? Cereal and toast or eggs and bacon? Beef or chicken? You get the idea. Some choices may seem minor at the time, but all of our choices bear consequences, either quickly or cumulatively. The most important choice we make in life is to acknowledge that we are sinners and receive Jesus as our Savior. But our choice to follow him doesn't end there. It isn't enough to receive him as Savior; we must also choose to let him reign in our lives as Lord. The difference that one choice alone can make in our lives cannot be emphasized enough. Surrendering to his Lordship is what takes us from living a carnal, ordinary existence like everyone else to living an abundant and fruitful life which results in joy and peace. A person who professes belief in Christ but lives according to the world's value system is a miserable person indeed. While God gives us the freedom to make our own choice to wholeheartedly follow or reject his teachings, the person who chooses to dabble in worldly sin and idle philosophies can never experience the true freedom of obedience to God's Word and will for his life. What side of the fence are you on this morning? Are you walking in total surrender to his will and obedience to his Word, or are you straddling the fence by keeping one foot in the world as you live life on your terms? I have lived both ways and found that the grass is far greener on God's side of the fence. If you want this to be an outstanding year, then make living for God your top priority. Everything else somehow falls into place when we choose to give God first place in our lives. Just two days into the New Year, already I am failing miserably in the "let go and let God" department! Such is the fate of a person like me with a controlling personality. Fortunately for us who have already broken our resolutions, we have a God who is infinitely patient and willing for us to try, try again! It has been said that it takes twenty one days to establish a habit. I pray that is the case, but I am convinced that letting go is going to be easier said than done. Why do we have so much trouble relinquishing control of our lives to God? Why is it so difficult to believe that the creator of the universe, the one who fashioned man from the dust of the ground and breathed into him the breath of life, can actually do a better job of running our lives than we can? Obviously there is something deep within us that cannot admit our weakness and our need for God's help. Only when we move beyond our foolish pride and humbly acknowledge God's desire and ability to do what is best for us, will we possibly be able to surrender to him those things we cannot control, but which somehow manage to control us. If you are ready to throw in the towel, don't! God never promised that surrender would be easy, but he does promise his peace and strength to those who focus and wait on him. Rather than quit, read and apply God's Word, ask his Holy Spirit to help you do that which you are powerless to do, and keep putting one foot in front of the other. Before long you will find that you have managed, with God's help, to scale the mountain you once thought impossible to climb. It is New Year's Day, 2011. As I finished transferring birthdays from last year's calendar to this year's, I realized that this is the year my firstborn will turn eighteen. The past couple of years have been challenging for us as he has struggled to find his wings and I have been slow to find the scissors to cut the apron strings. But make no mistake, the time has come. This is the year of letting go. Before writing my son's birthday on the calendar I had already determined that the thing I want most to accomplish this year is absolute surrender to the will and ways of God. I can think of no greater challenge as a mother than surrendering my son to God and relinquishing my control over the choices he will make. As parents we want the very best for our kids, but sometimes the very best requires hard choices on our part -- choosing to let them fail and learn from their mistakes, choosing to be wounded by their hurtful actions rather than protect ourselves by controlling them. Whoever said surrender was sweet? As we face the New Year, we all have areas of our lives we need to surrender to God, hindrances to lay aside so we can run the race God has set before us. We will all face opposition by those who sin against us and sin against God. Such is the nature of the fallen world in which we live. Surrendering a loved one or a stronghold of sin to God doesn't relinquish our responsibility to pray for that individual or work to overcome the sin. But letting go does free us up to "fix our eyes on Jesus, the author and perfecter of our faith, who for the joy set before him endured the cross, scorning its shame, and sat down at the right hand of the throne of God." May God bless you this year and draw you closer to him than ever before as you learn to "let go and let God."